Brothers Robert and Richard Sherman had written the scores to several Disney movies such as Mary Poppins and The Jungle Book. In the mid 1960s, Disney staff scriptwriter, AJ Carothers rediscovered the motion picture St. Martin's Lane and approached the Sherman brothers with the idea of purchasing the rights to the film and making a stage musical out it. The Shermans and AJ Carothers did just that in 1969, writing the musical Piccadilly. But nothing more became of it until 1982 when interest was rekindled, and the project was rewritten and renamed, Blow Us a Kiss. Still, nothing happened with the property until later in the same decade when interest was again sparked, and Tommy Tune became attached to the show. With a major Broadway star behind the project, the show was finally launched in 1995 with yet a new name: Busker Alley. The musical opened in April 1995 at the Macauley Theatre, Louisville, Kentucky as the start of a 16-city tour. It starred Tune and Darcie Roberts, Brent Barrett, Marcia Lewis, and The Huber Marionettes. Jeff Calhoun directed and choreographed, and sets were by Tony Walton. The producers planned to bring the production to Broadway in November 1995 at the St. James Theatre. Artist LeRoy Neiman created a 40-foot mural for Busker Alley on the façade of the theater, and the cast performed a number from the show at the 1995 Tony Awards ceremony. The production had numerous setbacks during the tour as well as two more name changes, including Stage Door Charley (unilaterally chosen by the producer's wife). The show finished its pre-Broadway tour as Buskers. The New York Times reported on September 1, 1995: "Neither show [Victor, Victoria and Busker] received unqualified raves during months-long out-of-town tryouts, but judging from the reviews, the problems on Busker, in which Mr. Tune plays a street entertainer in prewar London, were more severe. Last month, the show returned to New York to put in the rewrites by Peter Stone, and for a retooling by Mr. Tune, whose associate Jeff Calhoun directed and choreographed the show. Six weeks prior to moving to New York City, Tune broke his foot during one of the performances in Tampa, Florida. Although Tune's foot would have healed in time, the investors pulled out. The tour ended on October 8, 1995 in Tampa. In 2003 AJ Carothers and the Sherman Brothers revised their book and song score, changing the name back to Busker Alley. 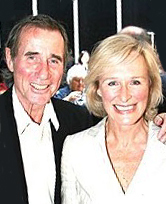 Jim Dale and Glenn Close in 2006 performing Busker Alley. On November 13, 2006 the York Theatre Company presented a one-night-only benefit concert performance of Busker Alley at the Kaye Playhouse at Hunter College. Jim Dale starred as "Charlie Baxter". Glenn Close appeared as "Dame Libby St. Albans" framing the show's main plot. (Dale and Close originated the roles of P.T. Barnum and his wife, Charity Barnum, in Barnum in 1980.) Also in the cast were: Jessica Grové, George S. Irving, Simon Jones, Noah Racey, John Bolton, Robert Fitch, Anne Rogers, Michael Lane Trautman, Cristy Candler, Diane Wasnak and Bonzer the dog. Tony Walton directed the production, with Lisa Shriver as choreographer. Aaron Gandy was the conductor, and Mark York the pianist. A CD of the performance was recorded on Jay Records. Busker Alley had been announced for a Broadway production for the 2008-09 season, with Tony Walton as director and designer and Jim Dale to star. In December 2008, the producers announced that the musical would be delayed. On August 25, 2009, the producers announced that they all were leaving the production, and, in a statement said (in part), "We will be returning all of the money to our investors and release all of our sponsors from their obligations." A CD which recreated this performance was released by Jay Records in 2007. "What To Do With 'Er"
"He Has A Way/She Has A Way"
"When the Moonlight's Bright In Brighton"
"Where Are The Faces (Charlie the Busker)"
"A Million Miles From You"
"The World of Beautiful Girls"
^ "Jay Records: Busker Alley: (2006 York Theatre Company Cast Recording) A Gala Benefit for The York Theatre Company". jayrecords.com. Retrieved January 24, 2017. This page was last edited on 28 December 2017, at 11:28 (UTC).